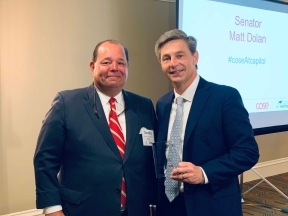 COLUMBUS - The Greater Cleveland Partnership (GCP) and its small business division the Council of Smaller Enterprises (COSE) today named State Senator Matt Dolan (R-Chagrin Falls) the "2018 Small Business Advocate of the Year." COLUMBUS - On Wednesday, the Senate passed legislation sponsored by State Senator Matt Dolan (R-Chagrin Falls) which permits for-profit corporations to become benefit corporations so they might more easily pursue social good in Ohio communities, in addition to making a profit. COLUMBUS - The Senate passed legislation today sponsored by State Senator Matt Dolan (R-Chagrin Falls) and State Senator Stephanie Kunze (R-Hilliard), which would strengthen criminal penalties for individuals who are convicted of promoting prostitution in Ohio. 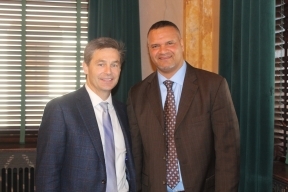 COLUMBUS-Senate President Larry Obhof (R-Medina) announced today that he will appoint Senator Matt Dolan (R-Chagrin Falls) as Chair of the Senate Finance Committee, the panel responsible for managing Ohio's biennial state budget bill. COLUMBUS-State Senator Matt Dolan (R-Chagrin Falls) today applauded local school districts that received above-average ratings on their 2018 Ohio School Report Card from the Ohio Department of Education. 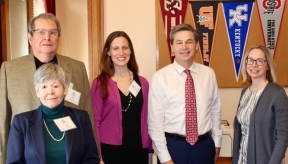 COLUMBUS-State Senator Matt Dolan (R-Chagrin Falls) applauds the teachers and administrators of seven top public high schools in Northeast Ohio, recently ranked by U.S. News and World Report. COLUMBUS-The Senate passed legislation today sponsored by State Senator Matt Dolan (R-Chagrin Falls) and State Senator Gayle Manning (R-North Ridgeville), which would strengthen criminal penalties for individuals who are convicted of promoting prostitution in Ohio. COLUMBUS-State Senator Matt Dolan (R-Chagrin Falls) and State Senator Gayle Manning (R-North Ridgeville) are working together with the Department of Homeland Security as well as federal and local law enforcement agencies to increase criminal penalties for individuals who are convicted of promoting prostitution in Ohio. "This bill continues the effort to return the wind setback requirements to a distance that encourages the development of wind energy in the state,” said Senator Dolan.